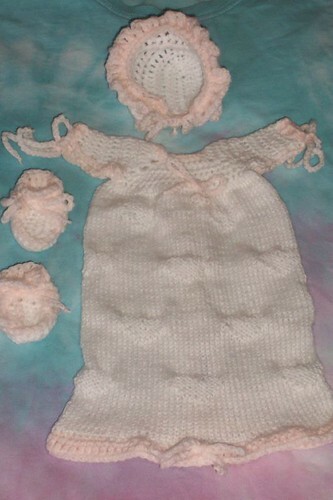 micro-preemie set (gown and bonnet) « T-Bird\’s crafty Blog! This set was based (loosely) on the Princess Preemie Layette but, as usual for me, very much altered to suit! All pics in this post are clickable to access bigger images. Dress bodice is as pattern except I don’t like the back loops only effect so I don’t do that bit! then 1 row was worked with 2 trebles (US doubles) into each stitch. The work is then knitted – 1 stitch for every treble – for roughly 10″ with a repeating hearts pattern in reversed stocking stitch. Sleeves are worked in half trebles working twice into each stitch on teh second row, 1 row no increase then 1 row work 1 skip 1 and 6 rows half treble. if I did this again I’d skip the shaping, it didn’t do what I wanted (puffy sleeve effect) and was fiddly to do. It’s worked back and forth not round so the underarm is open for easy dressing. The dress is trimmed in doubles (US singles) with 3 buttonholes being made up the skirt and 1 at the neck by making 2 chains and skiping 2 sts. A row of trebles is added on the bottom of the skirt and the sleeves. Chain “laces” were threaded through the trebles at the sleeves to close them, ribbon would be nice though. Bonnet is as pattern for back but worked in just trebles for 6 rows rather than shell pattern for top and sides. Sides and back are edged in contrast yarn and doubles. Ruffle is made by working 1 row of trebles in contrast colour then working twice into the sides (the post part as oppossed to the loops at the top) of each stitch with a chain between each stitch. Chain “lace” was threaded round the sides jsut above the trim row so that on fastening the bonnet will snug round the baby’s neck and keep it nicely in place. This entry was written by tbird and posted on 2 September , 2006 at 8:51 pm and filed under SCBU items. Bookmark the permalink. Follow any comments here with the RSS feed for this post. Post a comment or leave a trackback: Trackback URL. is it OK to link to this site, or would you prefer not? No probs Jax. Must do something with this template though…. vile isn’t it!